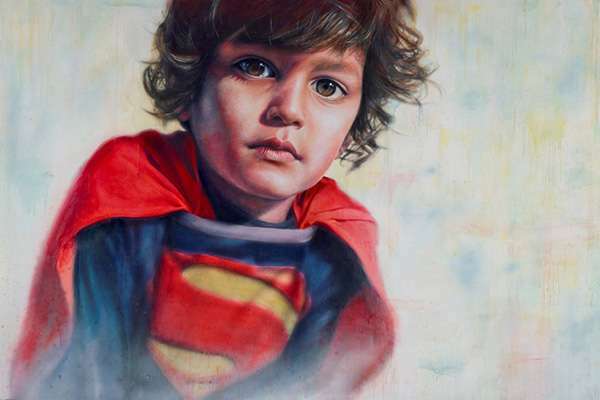 Award winning artist Vincent Fantauzzo is world renowned for his adept skill in portraiture and photography. Vincent Fantauzzo’s father Claudio was born in Rome, Italy, and his mother Rosaleen Mitchell was born in Ireland. Both families immigrated to Australia by boat in the 1950’s. Despite the upheaval experienced in moving, there was a sense of optimism as they settled in Australia. Claudio’s father Vincenzo was a well-known pastry chef in Rome; he started a shop in Acland Street St Kilda where he would sculpt historic Italian buildings out of cake. The Colosseum and the leaning Tower of Pisa were extremely popular. Claudio was working in the printing industry and Rosaleen was a homeopath. They met while living in an immigration camp located in the Melbourne suburb of Broadmeadows, and with the birth of their first child Otis, Rosaleen wanted to return to the United Kingdom. They did return in the mid-1970s and settled in the West Midlands. Shortly after arriving in England, the couple had two more children, with Vincent being born in Birmingham in 1977. Life was tough for the young family. There were unprecedented levels of unemployment in Birmingham during this time and outbreaks of social unrest between ethnic groups led to riots in the streets. Claudio and Rosaleen eventually decided their standard of living in Australia would be so much better, and that in fact it felt like home. The family returned in 1980 to Broadmeadows, which was considered at the time to be one of the roughest suburbs in Melbourne. Two more children, Marianne and Michael were born in the early 80’s. Rosaleen was the stability in Vincent’s life, for most of his upbringing. She was working full time as a masseur during the day and a homeopath in the evenings to support her five children. The family moved around a lot; Glenroy, Essendon, Brunswick and Moonee Ponds. ‘My mum is rather eccentric, and she encouraged all of her children to embrace their talents. I was allowed to draw on the walls, which was probably not that smart since we lived in rented properties. But I don’t think I would have become an artist if it weren’t for her encouraging my creativity’. Vincent was enrolled in St. Therese's School; a catholic primary school located in Essendon. School was hard for him; he was unaware at the time of his undiagnosed dyslexia, and he was dismissed as hopeless and stupid and placed in a class for special children. ‘There were deaf kids, naughty kids, angry kids and kids in wheel chairs’. It was a totally dysfunctional classroom which certainly undermined Vincent’s confidence. He compensated this by becoming the tough kid, getting into fights on the streets and in the school ground. ‘I had to be known as the tough kid, not just the kid in the special class’. Vincent didn’t even attempt to complete any assignments, and in fact he never attempted any homework either. ‘I was one of the most popular kids in the class, so in that sense I was very happy but I always felt I had to compensate for my learning disability, I guess I was always hiding something’. After completing grade six he went to St. Bernards College. Within the first year of high school his parents separated. Vincent was becoming debilitated by his dyslexia, and the pressure to help his mother and four siblings adjust to the new circumstances at home meant that an instinct for survival kicked in that would continue throughout his adult life. With no recognition of, or help for his learning disabilities, Vincent was soon expelled from school for ‘misbehaviour’. At the age of fourteen, he went to work as a kitchen hand in an Italian restaurant, with the promise of an apprenticeship that never eventuated. Desperate to fit in socially with his peers, 18 months later Vincent enrolled himself in Buckley Park College, a public secondary school in Essendon. His desire to achieve was palpable, however he was unable read or write anything. Vincent failed every subject, and left school for good 6 months later. There was a saving grace in sport at this time; he competed in athletics, amateur boxing and was winning tournaments in martial arts. ‘I was training really long hours and this gave me some sort of focus and a reputation not to mess with me, which was necessary in the commission housing environment my family was living in. Because of my rigorous training I never got mixed up in major crime or drugs which was all around me at the time. I was desperate to find a way out’. Boxing gave him direction and he embraced the opportunity to train under the supervision of Jack Rennie, trainer of the late Lionel Rose. Rose was a bantamweight boxer, the first Indigenous Australian to win a world title and the first Indigenous Australian to be named Australian of the Year. He became Vincent’s mentor and when he started painting seriously at the age of 19, Lionel Rose was one of the first people to sit for a portrait. Painting was something he was good at, so he started to paint a few sporting pictures. The fear of failing, or becoming a poor artist, gave him the drive to improve quickly. ‘One of the things that eventually helped me was predictive text on the mobile phone and spell check on the computer, I only needed to get a few letters of a word and technology did the rest. If you ask me about grammar and punctuation I have no idea. Even going to the supermarket was actually really difficult; I would buy a tin of beans instead of carrots because the tins looked the same. I could not remember what order the months of the year were and as for the four seasons, no chance, no matter how hard I tried I just couldn’t remember things’. 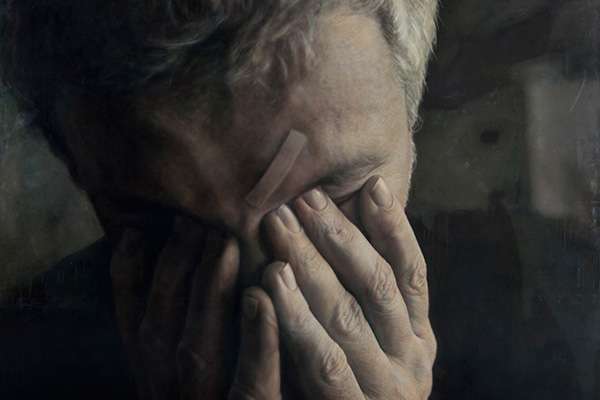 Because of his neurologically-based processing problems, he also has enormous difficulty recalling people’s names and struggles to remember any times for meetings and appointments. When he enrolled in RMIT he told the university he had completed high school ‘Thankfully nobody checked, and I was given a place. I had a few interviews, so I got away with it’. To pay for school fees and to pay other students to complete his assignments, he would sell the odd painting. ‘I got away with all of this until the third year when I paid a fellow student to complete my assignment. Unfortunately the person plagiarised the whole thing. I got caught and had to come clean about my learning problems. That was one of the toughest moments of my life, exposing myself like that. The University was really amazing and very understanding. Only then did I receive an evaluation, and they had me tested for dyslexia, helping me to face the problem. I knew all my school years something was wrong with me, but it wasn’t until that moment when they said I had an extreme level of dyslexia that I could put a name to it. Dyslexic is a hard word to google when you can’t spell it’. Vincent wanted to find out as much about dyslexia as he could and to possibly meet some other people who had the same problem. ‘I soon realised that there were many others who were in the same situation as me, but had excelled in particular fields, and that perhaps I could do the same with my painting. It was really my only chance and the only thing I was good at’. He embraced his dyslexia in a positive way, however it was difficult. Like his early school days, most people thought he was just stupid, but he knew he wasn’t, he was just different and it was confusing. 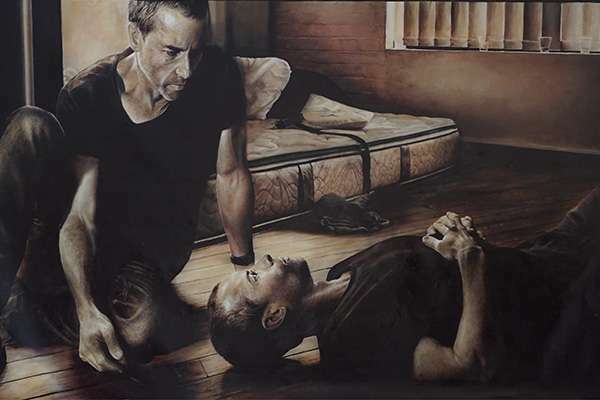 In 2003 with the enormous help of a disability liaison, he went on to graduate from Royal Melbourne Institute of Technology with a Bachelor of Fine Arts in Painting; he then completed his Masters of Fine Arts at RMIT University in 2005. Vincent then won an artistic residency at St Vincent's Hospital. In 2012 RMIT honoured him as an Adjunct Professor, a position he still holds today. In 2015 he devoted much of his energy to painting and working en plein air. Several journeys into Central Australia fired his enthusiasm for landscape painting and he commenced an ambitious project to paint a series of portraits of Aboriginal artists and a painting of their own country. These major works were completed as a triptych, they would comprise of one thoughtful portrait of the artist, focusing on the face and hands, one of their landscapes, displaying a sensitive and meticulous rendering of scenic detail and the third canvas would be painted by the sitter themselves in his or her own style. This extraordinary combination of paintings was exhibited at Nanda\Hobbs Contemporary in Sydney in April 2016, every painting found a home. Our knowledge of history and different cultures is learned from the artefacts left behind, like manuscripts and artworks. Before the invention of the camera and then the computer, the artist’s work was an integral part of the records of history, documenting technology, human affairs, natural history and indeed almost every aspect of the changing lives of individuals and society itself. Historically, portraiture dates back to prehistoric times, its evolution has mirrored the evolution of society in general. In the art of ancient civilisations artists depicted their rulers and their deities in the form of stylised paintings, cast in clay or plaster or bronze. The principal subjects then were, the Popes, Cardinals, Kings and Queens. Many portraits from the Romans and Greeks were pressed onto their coins, a tradition which continues today. Portraits used in this fashion were usually a symbol of what that a person actually looked like. The most ground-breaking moments in portraiture happened during the Renaissance times with artists like Raphael, Michelangelo and da Vinci. Leonardo da Vinci’s painting titled, Mona Lisa is certainly the best know portrait in the world and probably the best example of portraiture ever produced. Vincent Fantauzzo is mostly recognised for traditional portraiture, in painting and sculpture work. His portraits are painted with contrasting elements of light; they show much dignity, nobleness and focus on the more human and inner essence of his sitter’s character. They also draw on cinema and photography to create a narrative in the Grand Manner, a style derived from the classical art of the Renaissance. His growing body of work has been exhibited internationally with shows in India, Vietnam, New York, Los Angeles, Hong Kong and Australia. 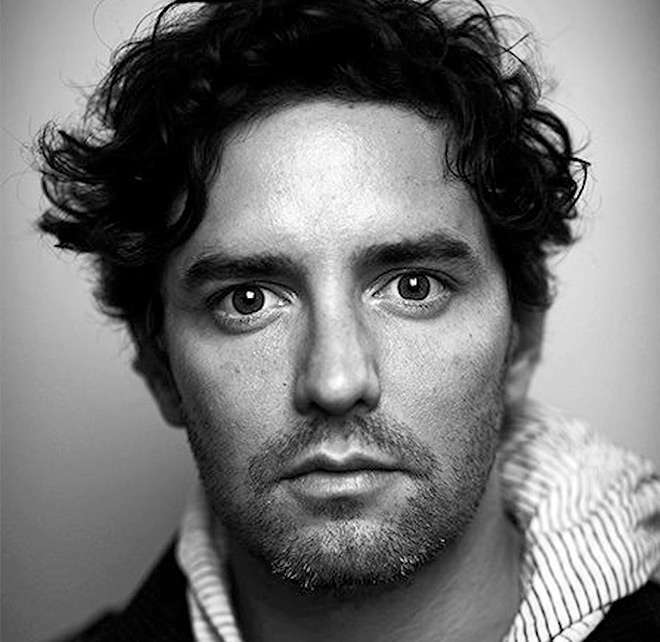 His multidisciplinary relationships have seen him collaborate with filmmakers, creatives, prestige brands and charitable organisations; he has ridden and painted his way across India on a motor bike with writer, director and producer Baz Luhrmann, and in 2011 he won the prestigious Doug Moran Portrait Prize for his moving depiction of Baz. He painted thirty portraits in thirty days in Hong Kong, New York and Australia, and has painted murals on walls in many countries around the world. He has won the Packing Room prize at the Art Gallery of New South Wales, and been awarded the Archibald People’s Choice more than any other artist. “Every time I paint a portrait it's a collaboration, there is a moment, when something lights up - you feel it going through your body” , that moment he has shared with many of his prolific subjects. 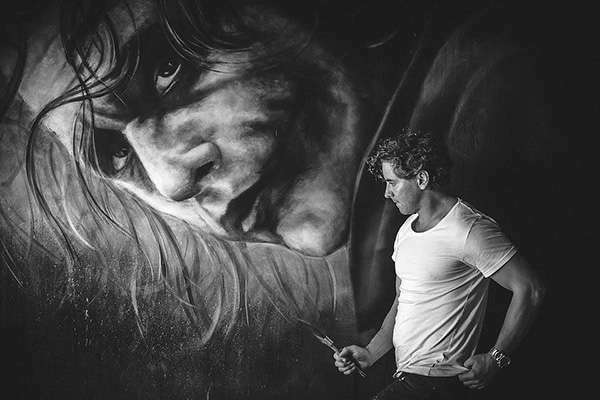 Some of his striking portraits include actors Heath Ledger, Asher Keddie and Brandon Walters, chef Matt Moran and racing legend Jackie Stewart. Along with the many dignitaries Vincent has painted, in 2017 he was chosen to paint the official portrait of former Prime Minister Julia Gillard for Government House.